While it was once considered okay to give our dogs any treats available, goodies are different today and more complicated. With reports of mold, banned antibiotics, dangerous additives, and other risks, commercial snacks for our furry friends are not always safe. Although not all pet food has the potential to be bad for your four-legs family member, homemade versions are a healthy, effective and easy way to love and reward your dog. We recommend any dog owner who enjoys homemade baking snacks for their furry friend to purchase a high-quality dehydrator. Preparing their treats in this kitchen appliance includes slicing up the vegetables, fruits or meat; placing them into the unit and leaving them for a specified period. The food you want to dehydrate needs to be suitable for your dog. Making healthy dog treats with a dehydrator is easy and if you want to know how to prepare them all you have to do is keep reading. NOTE: Food that is toxic to pets: chocolate, raisins, grapes, garlic, and onion. The best thing about dehydrated food is that it will last longer than you might think. If you made five pounds of dried treats for your pet, it could quadruple once you start feeding your dog with it. The five-pound weight counts only when the food is dry, but not when it’s wet. That means your pet snack will last for weeks or longer, depending on the size of your furry friend. Pet owners and veterinarians know the importance of keeping their dogs on a high-protein diet. Although many think that raw food is the best way to ensure their pets eats healthy, it has some drawbacks. Fresh meat is prone to bacterial contaminants and spoils quickly. 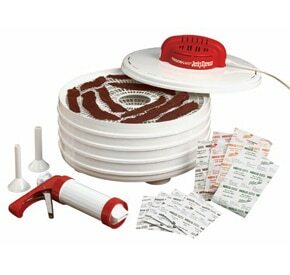 Dehydrated treats retain all of the essential nutrients found in meat. It requires no special storage and lasts longer. The fresh product’s enzymes, minerals, and vitamins remain in the food after drying process. If you are a hiker or love to travel and tend to take your furry friend everywhere you go, then dried treats are the perfect option for your dog. It is easy to pack it into a bag or luggage without adding too much weight. Just submerge it in water and have it ready in no time! Your dog will be more than happy! These treats will maintain the nutrition and taste for your pet and remove the hassle for you. It will take some time to prepare them, but what’s important is that they don’t lose valuable proteins. Also, you can be sure that they don’t have any harmful chemicals. That means they will provide the same benefits as raw treats. You can store this food anywhere you want because it will last longer than any wet food and kibble when you keep it at room temperature. Place it in an airtight bag, and it will have longer shelf life than any other pet snack. Are dehydrated treats safe for pets that have ailments and allergies? “Common dog allergies and ailments such as sensitive skin are often not caused by a lack of certain nutrients, but actually by intolerance to something currently in the diet. Commercial foods commonly featuring low-quality fillers such as starch, cereals, and grains, as well as additives and preservatives, can often be the cause of ailments and allergies. Many owners find that feeding a low processed diet made up of high-quality foods can resolve minor ailments without the need for additional supplementation.” according to DogBuddy blog. Size Matters: It is essential to keep in mind the size of your furry friend when you are making dried pet food. If you are preparing it for toy breeds or small dogs, bear in mind that they have little teeth and mouths, so they need less crunchy and smaller size treats. For dogs such as Weimaraner and Golden retriever, you can make larger and crunchier snacks. The great thing about these strips is that they are not made just for your dog, you can eat it too! Before slicing the meat, pop it into the freezer for fifteen minutes. Rinse off meat and make sure to remove all fat. Slice it into thick strips about ¼ inch to 1/8 inch. Use seasonings to coat the chicken breasts strips. The next thing you need to do is to place the meat on the dehydrator’s tray in an even layer, making sure to leave enough space between the slices. It is essential for the drying process that they don’t touch each other, so the air can flow adequately and dehydrate all the strips evenly. Put the tray into its unit and set the temperature at one 140 degrees F. For this meal, you will probably need to wait between three and twelve hours to dry fully. In simpler words, that will depend on the exact temperature of your appliance and how thick are your strips. After the first hour, make sure to check the food once every next hour. It is very easy to do that; just open the dehydrator and take one slice of meat out; use a sharp knife to cut it open and see how it looks inside. If it is adequately dehydrated, you should see no moisture, and the meat will have the same color throughout. Place it back in the unit if it is not done for another hour. When the dog meal is ready, use the sealed containers to store it. Or you can also use zip-locking bags because they are too excellent for food storage. If you want to last longer, you can place the container in the refrigerator. Make your own dehydrated chicken dog treats by following our instructions. You can substitute any vegetable or fruit in this recipe to add variety. You will notice that we used egg as a connecting agent, but if you want this meal to be all vegan, just mix longer the dough. Mix all the ingredient in a large bowl and work until you form a ball. Put a little flour on a cutting board, and roll out the mixed ingredients, so the thickness is about ¼ inch. Use a cutter (it would be best to use a cookie cutter that is bone-shaped) and cut the dough. Place it on the trays of the dehydrator and set it at one hundred and forty-five to one hundred and fifty-five degrees F. It will take six to eight hours until this snack is made. Bear in mind that this treat needs to be very dry, so make sure there is no moisture left and if required dehydrate it longer if you think it’s not ready. Most people think that these treats are most suitable for horses. But we are here to prove them wrong because your pooch will love this snack. In a large bowl, combine all the ingredients except the molasses. Then, when you have mixed it well, add the molasses and blend well. Make sure to add some additional oats if the dough is not stiff enough. On a cutting board, roll it out and cut into squares and shapes. Or you can use some cookie cutter. Place on the tray and put it in the dehydrator. Set the temperature at one hundred and forty – five to one hundred and fifty – five degrees F. Dry the meal for about four hours or more if necessary. Make sure that there is no moisture left and they are very dry. We all know how sweet potato is healthy. Making it for your furry friends will provide him a dose full of vitamins! Peel potatoes and wash them adequately. Cut them into slices that are ¼ inch thick. After you have done this correctly, you need to make sure that all the slices are equal, and place them on the trays. Put it in the dehydrator and set the temperature at one 145 to one 155 degrees F. Dehydrate this snack for about six to eight hours until they get the texture that is chewy. If you want them to be crunchier, just leave it in the unit for some additional time until they are done. For detailed instructions read our recipe for this healthy dog treat. This snack has all the proteins, and your pooch will just adore this treat. Combine wheat germ, oats, cornmeal and flour in a large bowl. Add water, vanilla, peanut butter, oil and stir well. Keep kneading, until the mixture is smooth, adding more water or flour as needed. At the cutting board, roll it out, so it is ¼ inch thick. Cut with the cookie cutter that is bone – shaped or shape into bars your pouch will love. Place it on the trays and put it in the unit. Set the temperature at one 145 to 155 degrees F. Dry this snack for about six to eight hours. If it is necessary, you should dehydrate them longer, because they need to be very dry. Always choose low-price meats and cuts that are marked down for same – day purchase. Because fats go rancid, we recommend using lean meats as they are the safest for jerky. Beef tongue is an excellent treat for your dog. Slice the meat into 1/8 inch to 3/8 inches thick pieces. Make sure that they are the same size so they can dry properly. Lay them out on the trays and place it into the unit. Set the temperature at 145 to 155 degrees F. Dry the meal for about three to twelve hours, making sure to check every hour after first two. When you want to check the meat, just slice it in half. The middle should be moisture free and dry, with the same color throughout. If it is necessary, just keep dehydrating the meal until it is ready. Your dog will surely enjoy this snack, no matter what meat you have chosen for him. After all, every dog loves the taste of an excellent dehydrated meat treat! The cost of making treats for your furry friend is much less than the one you bought. The best thing about the homemade dog snack is that you know exactly where the food has come from, especially meat and you are choosing your own ingredients. That is the safest way for you to know that there are no harmful chemicals in your pet food. The process of making it is really simple. It may take some period to prepare it, but you will have free time while making these treats. 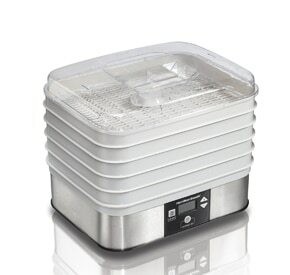 Just set up the dehydrator and let it do the job for you. The smell of the dried fruit, vegetable and especially meat will dry your four-legged family member crazy, and they will love their new homemade healthy snacks!